We just hit 150 follows on Twitch! w00t w00t!!! Another awesome DayZ stream! Today I was joined by Calvin & JR adventuring around Chernarus with a ghillie suits and crafted leather clothing. 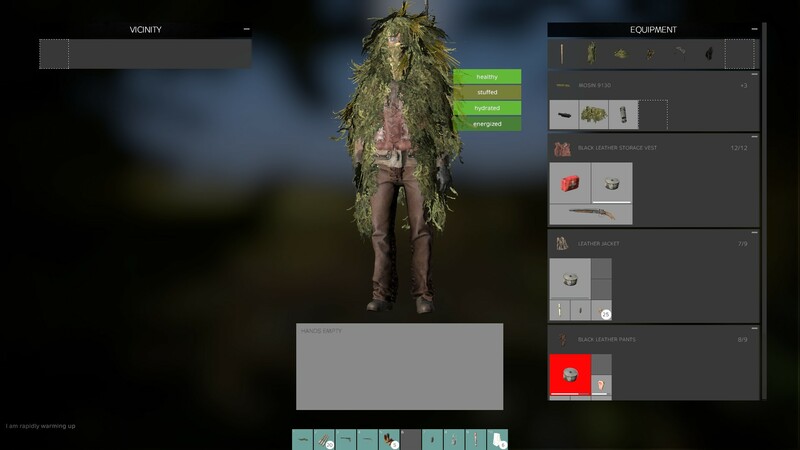 Those crafted leather clothing are definitely worth the effort to make if you are using a ghillie suit. The pants & jacket are both 9 slots and the vest is 12 slots! Bulk slots bro! We are armed with civilian rifles, I was using a Mosin and Calvin was using the SKS. As we were attempting to go a bit less military for a change. Unfortunately we only saw a single player for the entire 5 hours stream, which ended with me shooting a reasonably fresh player. None the less we had an enjoyable stream with plenty of chat & banter with the viewers in chat etc. I was planning a give away during the stream when we hit 150 follows. This was taking too long and we gave up waiting and just had a giveaway, K3nji13 was the lucky winner of a copy of Thief! Be sure to check back on my stream for a chance to win, we try to give away games regularly! We had several donations, thanks to Sweetest_kill, UnseenEyes, mobtek, CheeringUpCrew (not sure who this was but thanks?) & Vannie for all the donations, your support is hugely appreciated!!. These donations will go towards buying our next major giveaway, a copy of DayZ. Towards the end of the stream the DayZ server got a little slow and Calvin & I jumped in for a quick game of ‘Golf With Your Friends’, unfortuantely my game AND OBS both crashed, this is where we decided to call it a night. At the end of the stream, K0ng113 gave me a follow to take me to a total of 150! Thanks for that mate! Finally made it! We then proceeded to finish up the stream and headed across to CaptainVallochar’s channel for a nice TFB Raid! Captain was also kind enough to give me a follow, tipping me over the 150 to 151! Thanks again to everyone who jumped into my stream to hang out, a special thanks again to those awesome folks who donated and hosted my stream! Peace out all, until next time!